Welcome to Pfingst & Company! Located in South Plainfield, New Jersey, Pfingst & Company, Inc. was founded by Adolph Pfingst in 1905, when it started importing and distributing BUSCH™ dental burs. Otto Busch, a co-founder of German bur manufacturer Busch & Company, had asked his brother-in-law, Adolph Pfingst, to introduce Busch dental burs to the North American market. 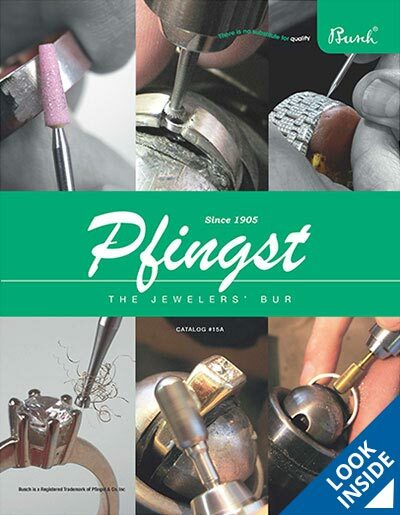 Five generations later, Pfingst & Company is known for delivering the industry's most respected and advanced tools, instruments, and related products for jewelers, dentists, and hobbyists. Pfingst has earned its reputation as an industry leader through its commitment to providing only the best quality products and services to its customers. The company is dedicated to understanding the needs of today's jewelers, dentists, and craftsmen and is committed to ensuring that its product line always aligns with those needs. Today, Pfingst features products from Busch, Horico, and Edenta, as well as assorted hand tools that are widely used by jewelers, dentists, artists, and craftsmen. Busch manufactures abrasives, carbide burs, and steel burs. Professionals who use Busch tools prefer them for their quality, consistency, and dependability. For over 100 years, there have been no matching substitutes for Busch products, because "There is no substitute for Quality". Horico produces diamond rotary instruments, sintered diamonds, and diamond abrasives. Horico products are the result of ongoing innovation, thorough production processes, and exacting inspection controls. Edenta offers specialized, silicone polishers. Edenta is a market leader in rotary polishing tools that are renowned for their innovative designs and quality materials. Pfingst products are available from reputable dealers throughout the USA and Canada, as well as in many overseas countries.